Today's doll is Bru Jeune which orignally designed by Bru was made at Saint Denis near Paris, France. 30 cm is a relatively compact size which fits nicely in homes. I met Bru through my 2nd lesson in England after a 2hr drive through M25, in Brighton, a town near the Sea. I attended a 2-day workshop to create one doll which was 23 inch with a wine-red long dress. The head was held by the left hand and painted with thin brushes, and eyelashes and eyebrows were also written. Now I use water based painting but at that time we used oil painting which made it difficult to make corrections. was also a lot of fun. 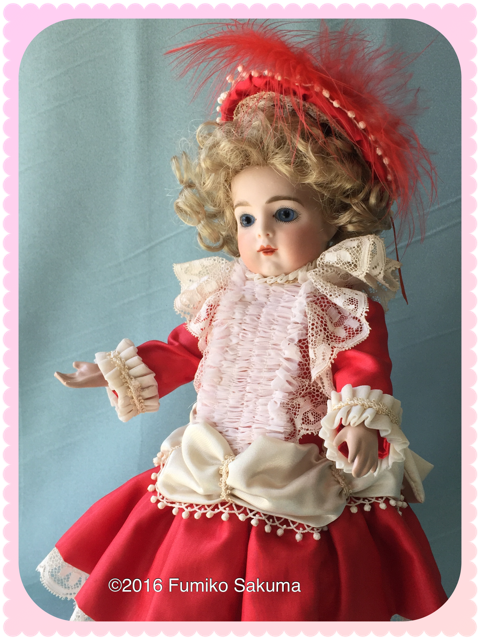 This original doll is very famous and you can see many of the same models in google search - but I believe each ones bring a different impression（Bru Jeune - Google 検索） - What kind of impression do you have for my work? I had an image for Christmas holidays in the Red Shantung Hat with a feather. I paid alot of attention in drawing the lips which shows the childish-like smile .